With obesity on the rise and other health issues becoming more common, it’s more important than ever to begin encouraging children to participate in and enjoy physical activity from a young age.All kids have naturally abundantenergy that they best expressthrough play, and in many cases, it’s effortlessto use exercise to achieve multiple goals at once. Swimming is perhaps one of the best methods for achievinga passion for fitness while offering a good outlet for energy because it doesn't seem like exercise to them. Whether you're instructing swim lessons for children or there is a pool accessible to students at your school, getting the kids in the water helps contribute to their future wellness. When the end of the school term approaches or when the last lesson with your group of swim students finally appears on the calendar, it's a good idea to consider letting your pupils relax and have some fun. Instead of just allowing for a complete free swim period, though, you can come up with all kinds of fun and games for them to enjoy during your last time together. What are some of the best activities to employ? Here's a quick look at a few excellent games and challenges you can organise. You might have heard this game called "sharks and minnows" amongst others, but it boils down to a basic game of tag with the difference that non-"it" players can leave the playing field temporarily to avoid becoming "it." One player adopts the role of the "shark" while all the other children in the pool are the minnows. The goal, like any game of tag, is for the shark to tap one of the minnows to transfer "it" status before swimming quickly away from the new shark. As a twist, allow the kids to hop in and out of the pool for a few seconds at the time, so they can quickly escape the shark. Thislets the game go on for much longer. Just be sure to warn the kids not to go running at full speed on the wet areas around the pool deck; that's a recipe for disaster, and certainlynot a fun time. This one requires some extra equipment, though if you can use a line of floating buoys or pool markers to rope off one side of the pool from the other, that will work as well. 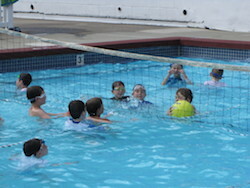 Otherwise, use a purpose-built pool volleyball net and grab a regular volleyball to throw in the water with the kids. If they don't already know the rules, it's easy to teach, and the game quickly becomes fast-paced, full of fun and lots of excited children. For largerclasses especially, this is a straightforwardgame to set up as it works best when you can evenly divide your pupils into two teams. You can institute this as the game for the entire session, or simplyrun a "first to X points" style game and move on to another activity once this one finishes. Divingis a classic pool activityand one that most kids go crazy for because it lets them show off their speed, diving skills, and other abilities to their fellow students. Get a few sets of weighted diving rings or sticks and throw into the pool at various points, from the shallow end to the deep end. There are several games you can try from here. In one version, line up the students at one end of the pool, throw in the rings, and challenge them to grab as many of them as possible within 30 seconds or 1 minute. Afterward, toss their collected rings back in for the next student. Whoever performs the best wins!You can also switch it to a "free for all" style, with students competing to see who can surface with the most rings or sticks at one time. Want to play a ball-based game but don't have access to a net for volleyball? What about a simple basketball hoop instead? Thisis another area where it is easy to find equipment for the purpose, though you won't be using a regular basketballin the pool. Choose something lighter and easierto heft towards the basket. You can also play a game such as "HORSE" where kids compete to make difficult trick shots their opponents must then try to replicate.Whoever fails to make fiveshots in total loses and is out of the game; the last person standing is the winner. It’s a classic game, and it works surprisingly well in the pool. 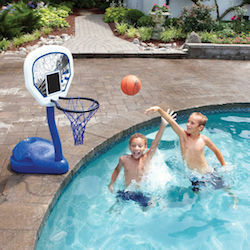 Kids will love jumping into the water as they throw the ball with gusto in the hopes of making it into the net. Do you have pool floats or fun noodles available for your students to use? While these are sometimes put to work helping students who aren't confident in the water yet, they're also a fun item to throw into the pool for kids to ride around on and have fun. You can turn this into a game too! Have several kids climb onto their fun noodles or pool floats on one end of the pool. On your mark, tell them "go!" — theymust race to the other side, and the first one there is the winner. Because of all the added resistance, it becomes toughto gain a lot of speed. The result is a fun and laughter-filled race that also doubles as a strenuous workout for the kids. Of course, nothing says that you must involve equipment to have races, especially if you're just designing a fun session forthe end of termswim class. Let your students show off their abilities and compete against one another to finish the most laps or to cross the pool and return as quickly as they can. You could even set up a tournament-style outing with heats in place to determine who will race for a small prize at the end of a session. You can ask your students what kinds of races they'd like to participate in, too, if you want to allow them more control over this fun swim time. Again, as with other activities in this list, we encourage you to try mixing and matching different games for a complete session. Did you know you could play a game with a watermelon? Okay: one last idea—and this one is a recipe for memories. Purchase a watermelon at your local supermarket, one which is not too large but also heavyenough to be somewhat difficultfor a child to handle. Bring it to your pool session and have all the kids get into the water. Using a petroleum jelly or another kind of lubricating agent, grease up the watermelon soit is incredibly slippery. Now throw it into the pool! 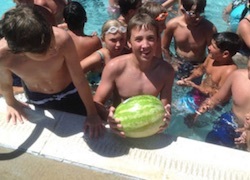 The goal for the kids is to be the first one to grab the watermelon and haul it out of the water. With the jelly and the pool water combining to create an extremelyslick surface, that's easier said than done. As simple as it may sound, this is a game that will leave your pupils exhausted but all smiles. From ring gathering competitions to races and even volleyball in the pool, there's no end to the number of variations you can come up with to create a fun final session in the pool. Not only is this an excellentway to cap off the term or a swim class, but it is also a fun way to experiment with activities you could incorporate into future lessons or visits to the pool. Spend some time planning your approach to get it right. Think about what kinds of games your particular class would enjoy the most, and don't forget to procure any of the necessary equipment in advance of your fun session. With everything in hand, you're prepared to do your part for helping kids embrace fitness. This article is exlcusive to Sports Fitness, browse our online store where you can shop for kids swimwear and accessories to cover all their pool needs.